Su-Pen brings a stylish, durable stylus, made by Japanese stationery craftsmen, to iPad and iPhone users with high quality ink and exceptional feedback through its special conductive nib. MetaMoJi , the provider of the leading mobile applications ‘Note Anytime’ and ‘7notes”, is proud to announce the launch of their original stylus “Su-Pen” to the US. 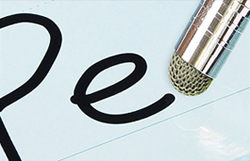 Su-Pen has been designed to specifically enhance the experience of handwriting on digital devices. The product has won numerous awards in Japan, where it was launched one year ago. 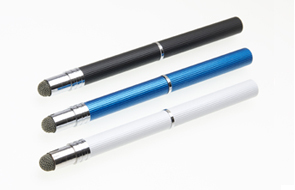 MetaMoJi is making the “Su-Pen” available to US consumers via the Amazon on-line store. “Su-Pen” has an original nib, manufactured from special conductive fibers into a structure that gives amazing control and a solid feel when touching a device’s screen. This is far superior to the feedback experienced from rubber ended stylus pens commonly found in the market, both in durability and inking quality. The Su-Pen has been designed to look good and is manufactured and finished by a team of writing instrument master craftsmen in Tokyo, Japan. The result is a stylus as aesthetically pleasing as it is functional. Su-Pen nibs are sold separately for users to enjoy in combination with existing pencil holders. This opens the opportunity for consumers to create original stylus combinations with a Su-Pen nib and the choice of market available pencil holders. Su-Pen has an original nib, manufactured from special conductive fibers into a structure that gives amazing control and a solid feel when touching a devices screen. This is far superior to the feedback from rubber ended stylus pens commonly found in the market. The body of each Su-Pen was designed and manufactured by a team of master craftsmen in Tokyo Japan, comprising 3 generations of experience in creating writing instruments. The result is a first class product that is as pleasing aesthetically as it is to use. For customers that would prefer to use an existing pencil holder as a stylus, the Su-Pen nibs can be purchased separately. 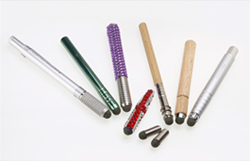 These are easily installed to create a wide choice of stylus configurations for different tasks and moods. Su-Pen web site for more information.